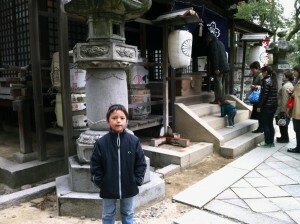 Went to the shrine as is the tradition in Japan today. Cosmo caused a shock (well, to my mother-in-law at least) by asserting his skepticism. “magic is pretend, and I don’t want to”. I never do, but I don’t make a deal out of it. This is something he felt strongly about this year for some reason and, well, I’m proud of him for thinking it through and making a stand about something important to him. Took me a lot longer. This entry was posted in Japan, Life, Skepticism on January 1, 2011 by Seth.